Britain will exit the European Union in 200 days on March 29, 2019 but a number of major obstacles still need to be overcome. Currently, a full exit deal has yet to be agreed with Brussels, with chief Brexit negotiatator Michel Barnier ruling out a resolution to this for the targeted date in October. Last week, he dealt a major blow to Prime Minister Theresa May’s Chequers plan after saying he was “strongly opposed” to key parts of her proposals for a post-withdrawal trade deal. He also warned that Britain can’t “cherry pick” which Brussels regulations it wants to adopt on exiting the bloc. 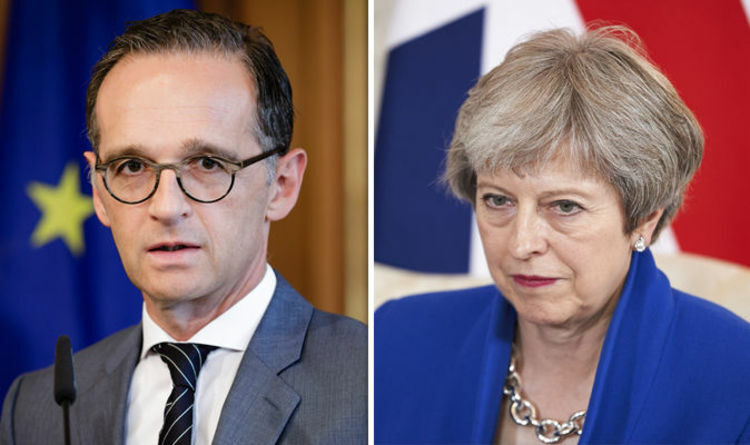 Speaking to daily newspaper Frankfurter Allgemeine Zeitung, German Foreign Minister Heiko Mass said: “We have no interest in it coming to a hard Brexit. “But that is not to be ruled out. Mrs May’s outlined proposals on economic and trade policy in a white paper in July, but Conservative Party lawmakers who want a clean break from the EU have heavily criticised the plan, claiming it offered a Brexit in name only. The Irish border issue is regarded as the toughest of the remaining issues in Britain’s exit negotiation from the bloc. But Mr Barnier said in evidence published on Friday that he was willing to consider new ways of solving this. German Chancellor Angela Merkel had offered encouragement when she said Germany was doing all it could to ensure that EU and Britain could reach a favourable divorce deal. But she also warned that success was far from guaranteed. Germany is prepared to accept a “less detailed” plan on the UK’s future financial and trade ties with the EU in order to push through a deal, Bloomberg reported citing unnamed sourced. The UK is also willing to settle for a vaguer statement of intent on the future relationship, postponing some decisions until after Brexit day, according to an official quoted in the report. The concessions could pave the way for a divorce deal being secured. The report came just a day after Brexit Secretary Dominic Raab told MPs a deal is “within our sights”.